Mandated to protect our water resources, the Metropolitan Naga Water District (MNWD) in partnership with the Rotary Club of Naga spearhead Water Conservation and Water, Sanitation and Hygiene (WASH) Caravan 2018. The first stop of the caravan was at the Calauag Elementary School in Naga City on August 1, 2018. The program was graced by the Grade 5 pupils together with their respective class adviser. Suffice to say, the MNWD caravan team received the warmest welcome from the pupils as well as, sincere greetings from the school head, Dr. Ma. Theresa R. Ruizo. Primarily set to provide a solution to the global and domestic challenges on Water Conservation and WASH through education, the program is composed of two parts. The first part entailed a discourse about MNWD as an organization, importance of watershed and water conservation including practical ways to save water. Meanwhile, the second part demonstrated the preventive interventions such as proper hand washing with soap and brushing of the teeth with fluoride toothpaste which the pupils excitedly volunteered to do. The team distributed bath soaps, toothpastes, and toothbrushes to ensure that the pupils maintain proper hygiene in school. Present at the kick-off event were the members of the MNWD Board of Directors Monina Lily A. Claveria who gave a sound introduction about WASH and Mike R. Pauig, who is also the Rotary Club of Naga WASH Project Chairperson. Moreover, the event will run for the remainder of 2018 in 14 public schools within the MNWD’s service area. KICK-OFF EVENT. The MNWD Water Conservation and WASH Caravan 2018 in partnership with the Rotary Club of Naga made its first stop at the Calauag Elementary School graced with the presence of its members of the Board of Directors Monina Lily A. Claveria (left picture) and Mike R. Pauig (right picture). WASH. 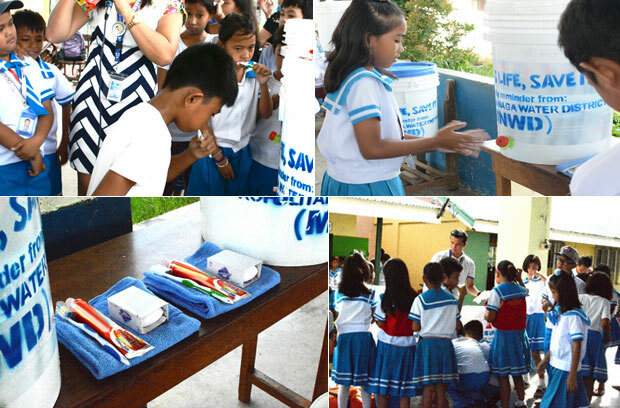 Included in the program is a demonstration of proper hand washing and brushing of teeth as these are the basic means to maintain physical hygiene.